From the window of my hotel room I can look down on a baseball diamond, glowing under the lights at night. I think I’m the only spectator, and I think they might be 12 years old. Their game just ended, and the two teams lined up at the center of the field– not to shake hands, as it turned out; instead, the two lines faced each other, and, in unison, bowed deeply. Then both sides posed together for a photo on the pitcher’s mound, and now they’re combing the infield with rakes like a sand garden. The group, however, is an interesting one. Take my new Cambodian friend, Nana, who introduces herself as the accountant and assistant at a foundation in Phnom Penh, only later mentioning that she actually has two other part time jobs. And is a grad student in the evening. And that she writes short books to help poor people learn English, but noticed that shops marked up her prices by 150%, so opened her own shop to sell the books, subsidizing the rent by also selling shoes and handbags. And that at night, she hosts a call-in radio program that reaches… a million people, seeking her advice. Also she’s 25. I’ll eat my hat if she’s not president in 15 years. I’ve hardly had a moment to see the city, but I have had the distinct pleasure of eating three meals each day, and the gastronomic tourism has been worth the trip in itself: raw fish, broiled fish, pickled vegetables, fried squid… At the conference, they give us lunch tickets, and we’re supposed to check off which of the half-dozen options we’d prefer. Confusion reigns, however, because “Pasta with Meat Sauce” was mistranslated as “Octopus with Meat Sauce,” “Eggplant” was confused with “Beef,” and the vegetarian option was somehow labelled “Stir-Fried Liver and Vegetables.” All pretty tasty, though, for the unpicky eater. Saturday evening, I hopped off the Tokyo subway at an arbitrary stop, the better to know the Japanese people. Fast walkers. Obedient at crosswalks. Ineffably polite. I grew peckish and sought refreshment: “Bubble Bar, 8th Floor” read the sign outside one building. Everything in Tokyo is stacked at least five high. “First time?” She asked, taking the hint, and I nodded. She began chattering with the patrons, pointing directorially, and they shuffled themselves to make a seat for me at the end of the bar. I sat, looked down the line, and ten heads, craning around each other, looked back, expressions now ranging from confusion, to disgust, to flabbergasted pleasure. I gave my toothiest “I’m just a big stupid white guy trying not to offend anyone” smile, and about half of them returned it. Generous, I’d say. Miwa, my colleague and Japanese interlocutor, later explained that I had wandered into a sort of Japanese speakeasy: a place where the same group likely gathered, night after night, year after year. “First time?” was probably not an honest question. As I sat, the Bubble Bar proprietor sauntered over, dishrag on his shoulder, and explained “his system,” which included an extravagant cover charge. Not wanting to create further disturbance, I meekly handed over 25 bucks for my miserable Suntory Lager. As I sipped, a stocky, middle aged man, his sunken eyes darkly circled, racoonlike, stood, and began reading from a document. Every few sentences, the crowd would cheer and applaud, and he would place a medal around someone’s neck. And it was a gallery of rogues: One man, his face puffy and droopy, eyes invisible, with a bouffant of thinning dyed red hair on his head. Another with the face of Kim Jong Il and the staccato laugh of Porky the Pig. Ultimately, the sunken-eyed man appeared to award the grand prize to himself. I was mercifully ignored, and made my escape as discreetly as possible, though I was noticed by one woman who, her face beaming with excited delight, waved frantically as I stepped back into the elevator. Looking down at my ballfield, the outfield lights are off now, and with his shadow long behind second base, a lone ballplayer is still circling the infield, straw broom in hand, meticulously sweeping dirt off the outfield grass, back to where it belongs. Despite my apparent popularity as I walk any street on the isle of Cebu– “hello!” “good morning!” “how are you!”– the white man a has a checkered history in this part of the world. Magellan was the first to arrive in 1521; he was promptly beheaded by Chief Lapu-Lapu, and his crew excused themselves in short order. The next Spaniards arrived some decades later, and had what must have been the surprise of their lives when the native Cebuanos whipped out a figurine of the Santo Niño that Magellan’s crew had left behind in their haste. Taking it as a sign, apparently, the Spaniards set about their missionary business with diligence, and had a terrific run over the subsequent 300-odd years until William McKinley took the restive Philippines off their hands. Washington was planning to liberate the country until a bevy of Republican Senators intervened and, well, actually maybe we’d better hang on to those islands after all. Following further decades of colonial oppression and attendant rebellion, MacArthur fled before the Japanese, who got their wartime use out of the Philippines most notably as a death-march locale and a favored source for “comfort women.” Then the Americans came back and finally made good on their promise: Filipinos walked free in 1946. Reform in Burma: Opening for the U.S.
Cebu City, Philippines – In October I wrote about the halting, confusing, but encouraging political reforms in Burma (Myanmar) over the past year. It’s been an exciting few weeks since then. At the ASEAN summit in Bali last month, President Obama announced that Secretary of State Clinton would go to Burma– the first visit of a Secretary of State since John Foster Dulles went to Yangon in 1955. The decision to visit, advertised as a test of Burma’s commitment to democratic reform, was understood widely as a small carrot to encourage further progress. Many, however, have criticized the Obama administration for rushing to reward one of the world’s most despotic regimes for what have been mostly cosmetic, reversible changes. The move was made possible largely thanks to the generous political cover of Aung San Suu Kyi, Burma’s foremost opposition leader and President Obama’s fellow Nobel Peace Prize winner. Aung San Suu Kyi’s party, the National League for Democracy, which sat out last year’s elections in protest, has decided to contest an upcoming election. Aung San Suu Kyi will herself run in the election, and is all but certain to be filling a seat in parliament. Though she has spent the better part of the past two decades under house arrest and has as good reason as anyone to suspect the motives of President Thein Sein’s incipient reforms, Aung San Suu Kyi has been upfront in her readiness to meet the government’s reforms in good faith. 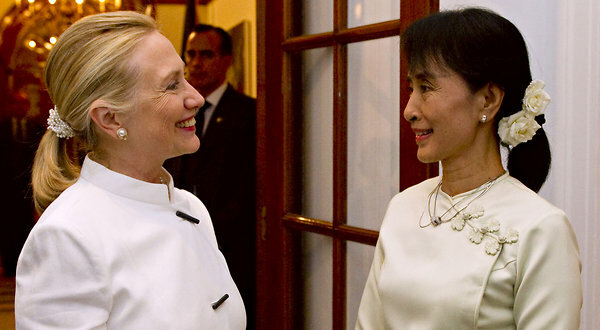 Secretary Clinton sat down with Aung San Suu Kyi– it was their first face-to-face meeting after much previous correspondence– and met with President Thein Sein, addressing a number of issues that have kept the U.S. and Burma apart. Atop the agenda was Burma’s collusion with North Korea on missile and (possibly) nuclear technology. Secretary Clinton also pushed Thein Sein to continue internal reforms by freeing political prisoners and resolving ongoing conflicts with ethnic minority groups. Coming out of the visit, Secretary Clinton announced that the U.S. would relax some restrictions on economic development aid, allowing the World Bank and International Monetary Fund to work in Burma, and promising $1.2 million in health, education and humanitarian projects to be administered by the United Nations. She and Thein Sein also discussed the possibility of upgrading diplomatic relations and exchanging ambassadors– a move that Aung San Suu Kyi has also advocated.